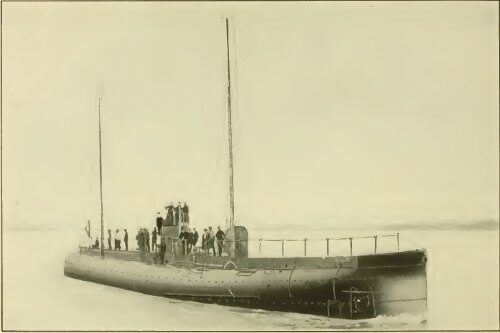 The idea of merchant submarines, a variation on standard merchant ships, has been suggested on multiple occasions, but has only been put into practice once, during WWI. In 1916 a class of seven u-boats was built by a private shipping company. These new u-boats were large, displacing over 2,200 tons, and with a wide beam to facilitate loading. They had no torpedo tubes or other armament, being civilian vessels operated by a civilian company, the North German Lloyd Line. Although they were large by u-boat standards, their cargo capacity of around 700 tons was relatively small by surface ship standards. Their ability to submerge to avoid detection, however, was a significant advantage for a country that was under an efficient naval blockade. The blockade, put in place by the Entente powers, was severely hampering German trade and making it difficult for German companies to acquire raw materials. Of the seven merchant submarines built, only two were used in their intended role, and of those two, SMS Bremen sank on her maiden voyage. SMS Deutschland made two successful round voyages to the United States. SMS Deutschland set off on her maiden voyage on 23 June 1916, with a crew of four officers and twenty-five men, under the command of Paul König. She carried 750 tons of high-value cargo (patented dyes, medicines and gemstones). She passed through the English Channel without detection, and arrived at Baltimore on 9 July 1916. Her arrival at Baltimore was noted by all belligerent nations, and great concern on the part of the Allies. König immediately made an announcement, in which he stated that “Our trip passing Dover across the ocean was an uneventful one.” and “Needless to say that we are quite unarmed and only a peaceful merchantman.” The crewmen were treated as celebrities during their time in Baltimore, due to the novel and remarkable voyage that they had undertaken. The naval architect Simon Lake visited the submarine, and made arrangements to build cargo submarines in the US, though this project never came to fruition. The Allies reacted quickly, sending a note of protest to the US Government. The United States, like other neutral countries, allowed merchant vessels from all belligerent nations to trade freely. However, the Allies’ note suggested that submarines should not be covered by such rules because they couldn’t be stopped and examined to determine which country they originated from, and whether or not they were actually combatant. The note further stated that there was a “capacity for harm inherent in the nature of such vessels“. 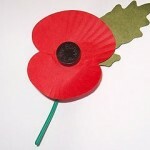 The Allies wanted neutral countries to detain any submarine from warring nations that entered one of their ports. They went so far as to make a veiled threat, stating that neutral submarines would be in “grave danger“, should they navigate regions frequented by belligerent submarines. Germany was putting a great deal of diplomatic pressure on the United States, claiming that, despite claiming to be neutral, it generally adopted a pro-Allied posture. On the 31 August 1916, the US Government sent a reply to the Allied nations, which took the German side. The strongly worded reply stated that the Government of the United States did not see any reason why submarines (either war or merchant) should not be covered by the existing rules of international law. The reply also specifically rebuffed the claim that neutral submarines may be in “grave danger”, stating that the US Government “holds it to be the duty of belligerent powers to distinguish between submarines of neutral and belligerent nationality“. By this time, the Deutschland was back in Germany, having departed Baltimore on 2 August and arrived back at Bremerhaven on 24 August. She carried 341 tons of nickel, 93 tons of tin, and 348 tons of crude rubber, the majority of the rubber being stored outside the pressure hull. Of the 8,450 nautical miles that she had travelled, 190 nautical miles were submerged. SMS Deutschland set off for its second journey to the United States in November 1916, this time to New London, Connecticut, carrying gems, securities and medicinal products. She set off for the return voyage on 16 November, but accidentally rammed a tugboat. 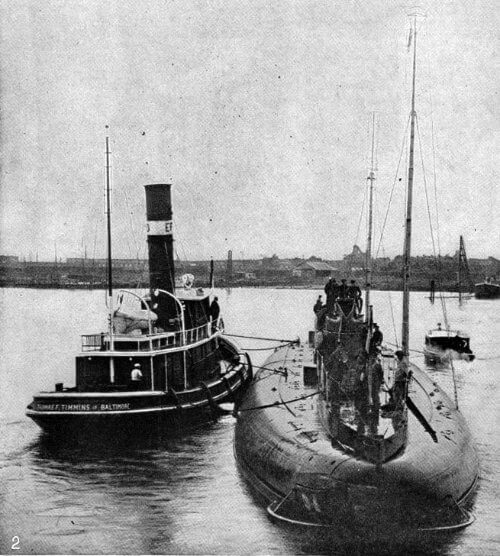 The tug sank with a loss of five lives, and the Deutschland‘s bows were damaged. After repairs, she left on 21 November, and returned home safely. A book entitled Voyage of the Deutschland, the First Merchant Submarine, with König credited as author (though it was probably ghost-written), was published in late 1916 and heavily publicised, in an attempt to sway public opinion in both Germany and the United States. A third voyage was planned for January 1917, but was cancelled due to worsening relations between Germany and the United States. In February, it was taken into the German High Sea Fleet and converted to a u-cruiser, number U155. She was fitted with two 15cm guns, two torpedo tubes, and could carry about thirty torpedoes. During 1917, she made a 105-day long cruise under the command of Karl Meusel. She sank 19 merchant ships and attacked 19 armed merchantmen, sinking nine of them. In August 1918, she sailed again, under the command of Ferdinand Studt, with orders to cruise off the US coast, laying mines and cutting telegraph lines. This cruise was much less successful than the 1917 cruise, laying her mines in the wrong place and failing to locate a telegraph line. She sank three merchantmen, but was damaged on 13 September, rendering her temporarily unable to dive. She returned to Germany on 12 November 1918. 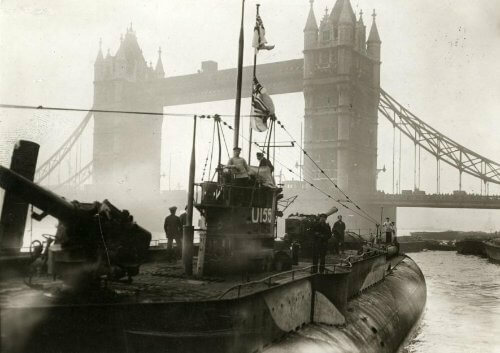 She was taken to Britain, where she was put on display before being sold for scrap in 1921.